Jeffrey Earnhardt goes for a spin in practice at Darlington. (Photo Credit: John Harrelson/Getty Images for NASCAR). Yesterday news spread quickly that Jeffrey Earnhardt, grandson of the late Dale Earnhardt, had been released from his contract at Rick Ware Racing. According to reports and a war of press releases from each Ware and Earnhardt, it appeared Earnhardt had began shopping around sponsor Fuel Doctor to other teams in hopes of landing a ride elsewhere. However just as bazaar as things seemed in this story, today is a new day and things have officially taken another twist. Jeffrey Earnhardt will still be driving for Rick Ware Racing, at least in Martinsville. In a press release Rick Ware, owner of the No. 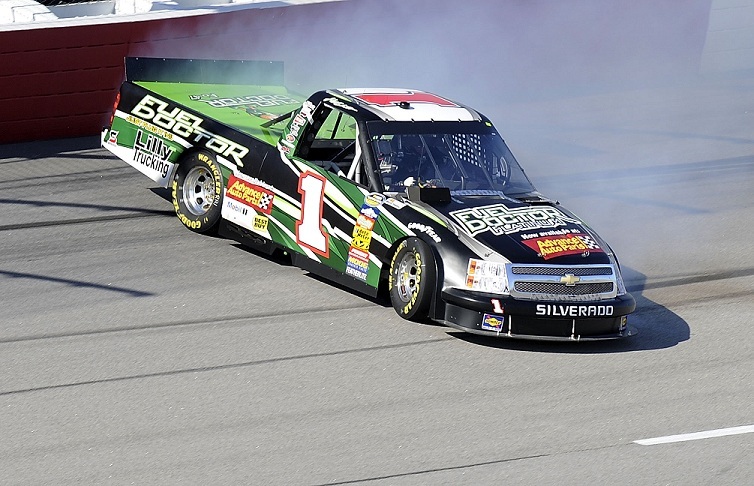 1 truck that Earnhardt has piloted thus far in 2011, explained why he has opted to let Earnhardt still drive the truck at Martinsville. In the same press release Ware hinted that the team will do everything they can to keep Earnhardt in the truck for the foreseeable future. “Jeffrey will be in the truck at Martinsville and we will work hard to continue to keep him in that seat. The amount of effort we have poured into his career and having a place for him to perform is important in his development. He is young and there is a lot of promise in him and both the management of RWR and JEI have the same goal for him,” Ware continued. Earnhardt enters Martinsville 10th in the NASCAR Camping World Truck Series point standings in his first full-season driving in the division.